Headed by Tim Houghton, CAS is monitoring this MD/DC Audubon IBA area for Cerulean Warblers and Wood Thrush, both species of concern along the Atlantic Flyway. 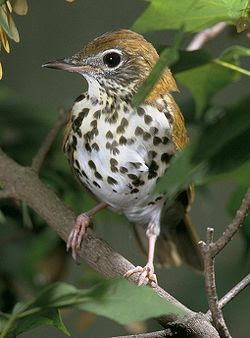 According to National Audubon, the Wood Thrush population has been declining about two percent a year since the mid-1960's mostly due to habitat loss on both its breeding and wintering grounds. 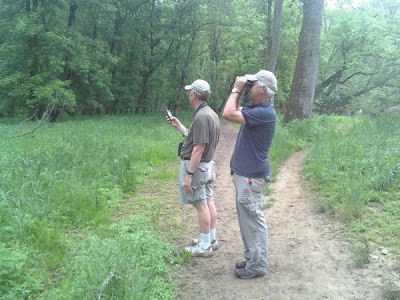 Tim Houghton (left) and Kevin McCahill documenting the location of a bird. 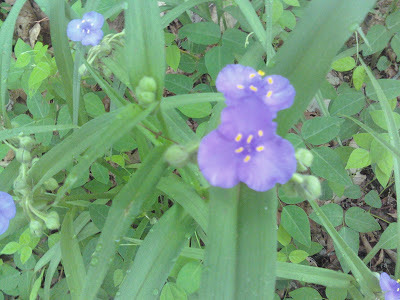 Spiderwort was blooming and was quite plentiful in areas. We would like to acknowledge Christine Holzmueller and Norm and Karen Meadow for the donation of 2 GPS units to assist with this project. May 11, 2013. It wasn't the prettiest of days, but the birds didn't care. Many new migrants had just arrived, and we tallied a total of 80 species for the Harford Bird Club spring count. A pair of Green Herons calls Harford Glen home. Photo by Fred Brundick. Sometimes Tree Frogs appreciate bird boxes too! This wetland is the result of an incredible Beaver Dam. 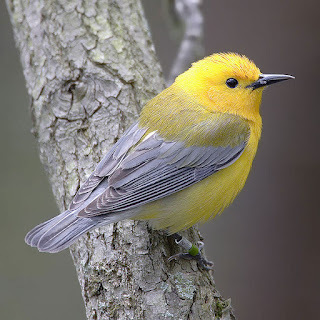 Our list of birds include Wild Turkey, Least Tern, Least Flycatcher, Scarlet Tanager, American Bittern, Least, Spotted, and Solitary Sandpipers. Warblers include Yellow, Blackpoll, Black and White, Blackburnian, Parula, Black-throated Blue, Ovenbird, and both Waterthrushes. Join us for the count next year! Spring migration has finally started! It was a perfect spring morning for a bird walk, and as usual, Patterson Park had many surprises for us. One of our first birds was a Chestnut-sided Warbler, which was singing, but very hard to view. An Eastern Phoebe sang nearby, and we then added Warbling Vireo, Red-eyed Vireo, and stumbled upon about 30 White-throated Sparrows which were refueling on their way north. As we approached the pond, we noticed the bird of the day - an American Bittern! A newly arrived American Bittern searching for breakfast. ﻿ We tallied 48 species! Patterson Park Audubon sponsors a walk the last Saturday of the month, and on the 2nd Tuesday of the month, the bird walk is led by Chesapeake and Patterson Park Audubon. Please join us next time. Today the number of birders roaming the park outnumbered the parulas! We noted Baltimore Oriole, Great Crested Flycatcher, Northern Parula, White-breasted Nuthatch, and Osprey near the parking area. Ten of us on a Chesapeake Audubon field trip had a wonderful time at Susquehanna today, even though the migration isn't what it normally would be at this time. We had many highlights. Fantastic, close looks at CERULEAN WARBLER, KENTUCKY WARBLER, WORM-EATING WARBLER, and PROTHONOTARY, as well as Louisiana Waterthrush. Also nice views of Baltimore Oriole, Common Merganser, and Great-Crested Flycatcher--and even a Wild Turkey. Walking along the old railroad river trail looking for the Prothontary and Louisiana Waterthrush.